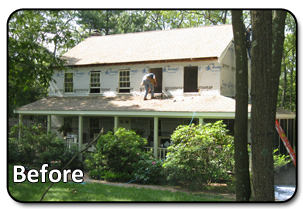 Looking for siding contractor in your town of Plainville, MA? Here to the right is a before picture of project we did in your town. We stripped the existing siding and replaced rotting wood, installed new house wrap and Chestut colored Everlast Composite Siding. We also removed old fencing from their in-ground pool and painted their entire trimming of the home, while staining their porch floors. 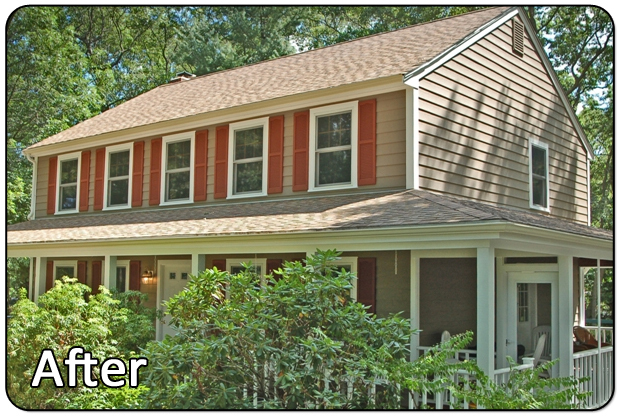 These homeowners were quite pleased with the new look of their home!